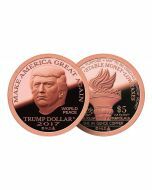 The 2017 Proof Copper Inaugural Trump Dollar is painstakingly created from an original sculpture of Donald J. Trump. 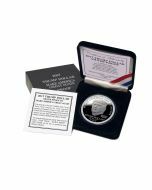 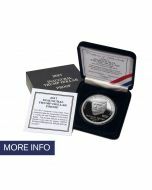 It is minted in stunning proof condition with six strikes by the proofing press from a special Ultra High Relief (UHR) obverse die to create a deep flawless mirror-like proof finish that has vastly superior quality and eye appeal than the lower relief, brilliant uncirculated proof-like issue. Each Copper Proof contains one AV ounce of pure copper that is packaged in a tamper proof capsule and a gift box with Inaugural Trump Dollar printed outer box and a Certificate of Authenticity. 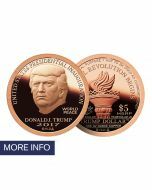 The 2017 Proof Copper Inaugural Trump Dollar is $19.95 each.